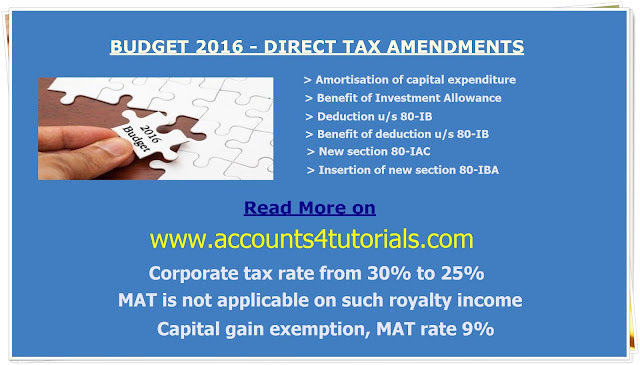 The corporate tax rate has been reduced to 29% where the gross receipts of the company do not exceed INR 5 crores. In other cases it is @ 30%. Manufacturing companies set up and registered on or after 01.03.2016 shall have an option to pay tax @ 25%, provided no profit or investment linked incentives, accelerated depreciation, investment allowance, expenditure on scientific research and certain deductions covered under Chapter VI-A. Deduction for infrastructure facility including power generation and distribution, development of SEZ and production of mineral oil and natural gas - 31.03.2017. Weighted deduction of expenditure incurred on in-house scientific research to be restricted to 150% from 01.04.2017 till 31.03.2020 and 100% thereafter. Accelerated rate of tax depreciation is restricted to 40% for both old and new assets from F.Y. 2017-18. It is proposed to tax the non - compete fee received by professionals as business profits under section 28 in the hands of the recipient. Business losses in respect of specified business (cold chain facility, warehousing facility for agriculture produce, two star category hotel, etc.) can be carried forward and set- off only if return is filed within the relevant due date. The benefit of additional depreciation u/s 32(1)(iia) @ 20% on new plant and machinery has been extended to the business of transmission of power. This amendment will take effect from 01.04.2017. The benefit of Investment Allowance u/s 32AC (1A) has been extended to31.03.2017. Further, a new provision has been inserted to allow the deduction in the year of installation irrespective of the year of acquisition. This amendment will take effect from 01.04.2016. A new clause has been inserted to Sec 36(viia) to extend the claim of 5% of total income as provision for bad and doubtful debts even to NBFCs. This amendment will take effect from 01.04.2017. The deduction of 30% for additional wages paid to new workmen in a factory for three years extended to all assessees subject to tax audit, as against assessees deriving income from the manufacture of goods in a factory. The condition of 10% minimum number of persons employed during the year is relaxed and an employee can be employed for a minimum period of 240 days instead of 300 days with a monthly emolument paid or payable to be less than INR.25,000/-. No deduction shall be admissible in respect of employees for whom the government is paying the entire EPS contribution or an employee who does not participate in the RPF. The expenditure in connection with online advertisement or digital advertising space or any other facility or service for the purpose of online advertisement and includes any other notified services, shall not be allowed while computing the income for consideration paid or payable to a non-resident on which equalisation levy is deductible if not deducted or paid. With effect from 01.06.2016. The deduction in respect of sums payable to the Indian Railways for use of railway assets would be allowable in the previous year in which the liability is incurred, only if paid on or before the due date of furnishing the return of income, else would be allowed on a payment basis in the year in which such a sum is actually paid. It is proposed to increase the threshold limit under the presumptive taxation scheme prescribed in section 44AD to INR 2 crores. The transfer of capital assets on conversion of a company into a LLP is not considered as a transfer subject to certain conditions. The value of total assets in the books of account of the company should not exceed INR 5 crores, in any of the three previous years preceding the year of such conversion. With effect from 01.04.2017. Where the date of the agreement fixing the consideration and the date of registration are not the same, the stamp duty value on the date of registration may be considered as full value of consideration provided the consideration, in full or part, has been paid through banking channels before the date of the agreement. With from 01.04.2017. To promote the ‘start-up’ businesses, exemption from capital gains tax is provided if the proceeds are invested by an assessee in units of specified fund, as may be notified by the central government, within six months, subject to a lock in of three years. The investment in the units of the specified fund during any FY will be allowed up to INR5 million. 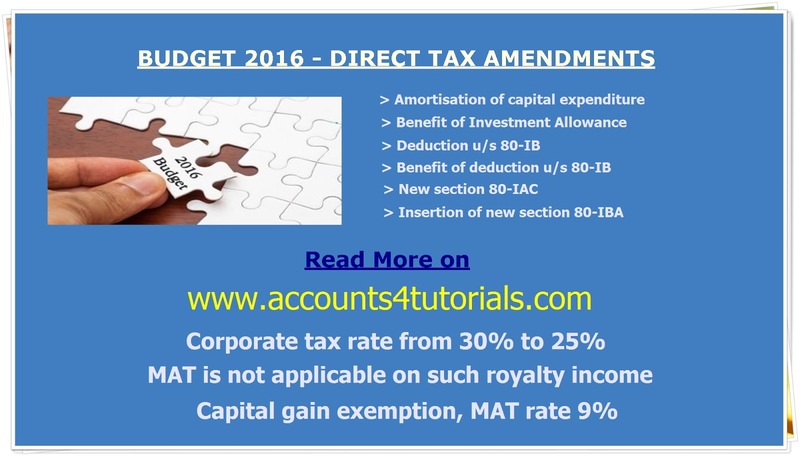 The benefit of deduction u/s 80-IA will not be applicable for enterprise which starts the development or operation and maintenance of the infrastructure facility on or after 01.04.2017. This amendment will take effect from 01.04.2017. The benefit of deduction u/s 80-IAB will not be applicable for enterprise being a developer of SEZ which commences its business on or after 01.04.2017. This amendment will take effect from 01.04.2017. Insertion of new section 80-IAC to provide 100% deduction of profits by an eligible start up from a business involving innovation, development, deployment or commercialisation of new products, processes or services driven by technology or intellectual property for a period of 3 consecutive years out of 5 years if incorporated before 01.04.2019. This amendment will take effect from 01.04.2017. The benefit of deduction u/s 80-IB will not be applicable for industrial undertakings other than infrastructural development which commences its business on or after 01.04.2017. This amendment will take effect from 01.04.2017. Insertion of new section 80-IBA to provide 100% deduction of profits from housing projects for flats of 30Sq.M in 4 metro cities and up to 60Sq.M in other cities, if the project is approved by competent authority on or before 01.04.2019. Further, the deduction shall be deemed as income if project is not completed within 3 years of deduction. This amendment will take effect from 01.04.2017. No Dividend Distribution Tax (DDT) proposed for dividends declared by a Special Purpose Vehicle (SPV) held by business Trusts (REIT and InvIT) out of the income of such SPV starting from the date of acquisition by BTs subject to meeting prescribed shareholding criteria. With effect from 01.06.2016. Special incentives proposed: capital gain exemption, MAT rate 9%, exemption from DDT if dividend declared from current year profits for units located in an international financial services centre (IFSC) set up under the SEZ Act, 2005 deriving income solely in convertible foreign exchange. It is proposed to amend Sec 115UA(3) so as to provide distributed income from business trust which is in the nature of dividend u/s 1150-O(7) will not be included in the hands of Unit Holder. This amendment will take effect from 01.04.2017. It is proposed to strengthen the processing of intimation u/s 143(1) after the considering missed outs from the audit report returns of earlier years, Form 26AS, Form 16 and Form 16A. However, the opportunity will be provided to respond either in writing or e–mail within a period of 30 days of time. With retrospective effect from 01.04.2016. Advance tax payment schedule of 15%, 45%, 75% and 100% of tax by 15th June, 15th September, 15th December and 15th March respectively, currently applicable to companies, extended to all assessees. Further, for assessees paying presumptive tax, 100% advance tax to be paid on or before 15th March. 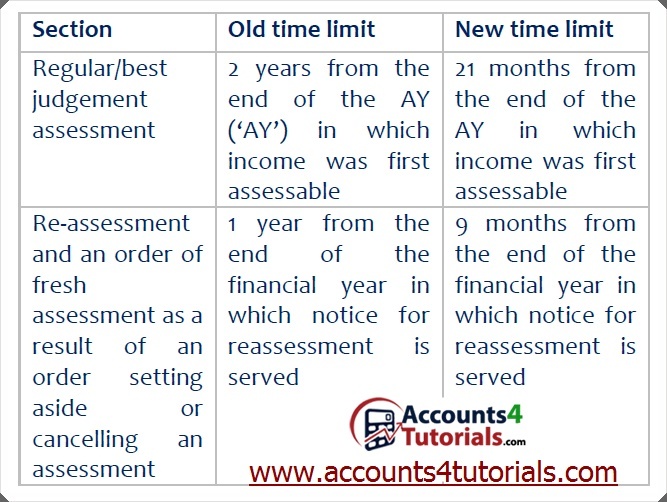 A new section 270AA has been inserted so as to provide no penalty if assessee pays the tax and interest payable as per the order of assessment or reassessment within the period specified in such notice of demand and does not prefer an appeal against such assessment order and if an application has been made to AO to grant immunity within one month from the end of the month in which assessment or reassessment order was passed. It is further proposed that the Assessing Officer shall, on fulfilment of the said conditions and after the expiry of period of filing appeal as specified in Sec 249(2), grant immunity from initiation of penalty and proceeding under section 276C if the penalty proceedings under section 270A has not been initiated and shall pass an order accepting or rejecting such application within a period of one month from the end of the month in which such application is received. This amendment will take effect from 01.04.2017. Penalty provisions u/s 271 w.r.t. failure to furnish returns, comply with notices, concealment of income etc. shall not apply to and in relation to assessment for A.Y. commencing on or after 01.04.2017. This amendment will take effect from 01.04.2017. It is proposed to amend 271A w.r.t failure to keep, maintain, or retain books of accounts, documents by inserting “Sec 270A” after the words “Without prejudice to the provisions of”. This amendment will take effect from 01.04.2017. It is proposed to amend 271AA w.r.t failure to keep, maintain, or retain books of accounts, documents u/s 92D by inserting “Sec 270A” after the words “Without prejudice to the provisions of”. Further, Penalty of INR 5,000/- may be levied u/s 92D for non-furnishing of documents by a constituent entity of International group refereed u/s 286. This amendment will take effect from 01.04.2017. It is proposed to amend Sec 271AAB(1)( c) so as to levy the penalty on Undisclosed income at a flat rate of 60% as against 30% - 90%. - INR 15,000/- per day for which failure continues beyond the period of one month. - INR 15,000/- per day from the day of service of order directing to pay the above penalty. c) If assessee provides inaccurate information or documents u/s 286(6), penalty of INR 5 Lakhs shall be imposed. This amendment will take effect from 01.04.2017. It is proposed to amend Section 272A by inserting a new clause (d) to include levy of penalty of INR 10,000/- for each default or failure to comply with a notice issued u/s 142(1) or 143(2) or failure to comply with a direction issued u/s 142(2A). It is also proposed to amend Section 272A(3) that penalty u/s 272A(1)(d) shall be imposed by the income tax authority issuing such notice or direction. This amendment will take effect from 01.04.2017. It is proposed to amend Section 273A so to provide the power to reduce or waive penalty imposed u/s 270A. This amendment will take effect from 01.04.2017. It is proposed to amend Section 273AA and insert anew sub section (4A) to273A to provide that an order accepting or rejecting the application of an assessee shall be passed by the concerned Principal Commissioner or Commissioner within a period of 12 months from the end of the month in which such application is received. It is proposed to amend Section 273B by including Section 271GB also in the basket of Section 273B wherein penalty shall not be imposed on the person or assessee for any failure, if he proves that there was reasonable cause for the said failure. It is proposed to amend Section 279 by providing that the prosecution proceeding shall not be proceeded against a person for offences under section 276C or section 277 in respect of whom penalty under section 270A apart from Section 271(1)(iii) has also been reduced or waived under section 273A. This amendment will take effect from 01.04.2017. Proceedings u/s 132(5) are brought out from the ambit of Section 281B. Further, it is proposed to insert new sub sections (3) to (9) to this section which provides that the Assessing Officer may revoke the attachment by an order of writing if assessee furnishes a guarantee from Scheduled Bank for an amount not less than FMV of property attached. The Assessing Officer may further make a reference to valuation officer u/s 142A to estimate the FMV of property attached and report to be submitted within 30days of such reference. An order should be passed for revoking within 45days, if reference is made or within 15 days, in any other case from the receipt of guarantee. Further, where an assessee fails to comply with the notice of demand, fails to renew guarantee or fails to furnish a fresh guarantee, then Assessing officer may invoke the guarantee and adjust the same with existing demand. It is proposed to amend Section 282A(1) by providing that notices and documents required to be issued by income tax authority under the Act shall be issued by such authority either in paper form or in electronic form. This amendment will take effect from 01.04.2016.